Painting with a twist. I was visiting my family in Tampa for Christmas and was delighted, and then rushed with anxiety, to find out that my mom had booked us a class at Painting with a Twist. I have always been artsy and have been aware that I posses some creative talent, though at which capacity I have never been sure. However, I can not express the amount of anxiety and self doubt I have suffered with from this topic. Since I was a child, my family has ranted and raved about everything I put a pencil, marker and paintbrush to. Endless conversations have been had regarding my talent and how I should be using it. Amidst all of the praise, I have always felt that my talent wasn’t good enough. That it was nothing compared to others. It was this self doubt, that lead me to choose an educational path in accounting; in hopes of securing a sure thing of a career which would give steady and reliable pay. Once a degree was in clear sight, I re-analyzed my situation. Would I be happy in the world of numbers and spreadsheets? Would I be fulfilled? I applied to the Fashion Institute of Technology’s fashion design program. I submitted a portfolio that I would be embarrassed to show anyone today. By the grace of God, I was accepted. I spent the next year in the intensive design program which was 9-5pm, Monday – Friday and sewing every night until 3am. People asked me to describe what this experience was like, and my best answer is, project runway. I was selected to be in the final exhibit and received much praise for my designs, but despite everything, I was still plagued with not feeling good enough. I obtained my degree and then was faced with the ultimate question. Would I follow the path of fashion design and take an unpaid internship in hopes that somehow I would get lucky enough to meet the right person along the way? No. Though I have a very creative mind, I am far too realistic, reasonable, and risk adverse. I suppose this is why accounting happened to ironically be a good fit for me. I couldn’t fathom working for free when I could be working at a public accounting firm making good pay and creating a stable career for myself (especially when there were far more in the fashion world who I viewed as much more talented than I). This is what lead me to where I am today. 3 years later, working at a hedge fund, which I enjoy. This side story ,though long, I felt was necessary to help assist in how I felt going in to painting with a twist with my family. The pressure. Before heading to the class my Grandparents of course told me they expected me to bring back a masterpiece. All the familiar feelings rushing back from when I was young. I hadn’t painted in probably close to 15 years. Would I have lost my touch? Do I even remember how to hold a paintbrush? I would let everyone down if I didn’t perform up to their standards. I was anxious. We walked in to a packed class and I was happy to find our seats were towards the back. Another ironic thing about me is that I am very easily distracted yet have a job where I sit minimum 9 hours a day in the same spot staring at a computer. To my surprise I was able to follow the instructors guidance of what we should be doing for about 5 minutes. 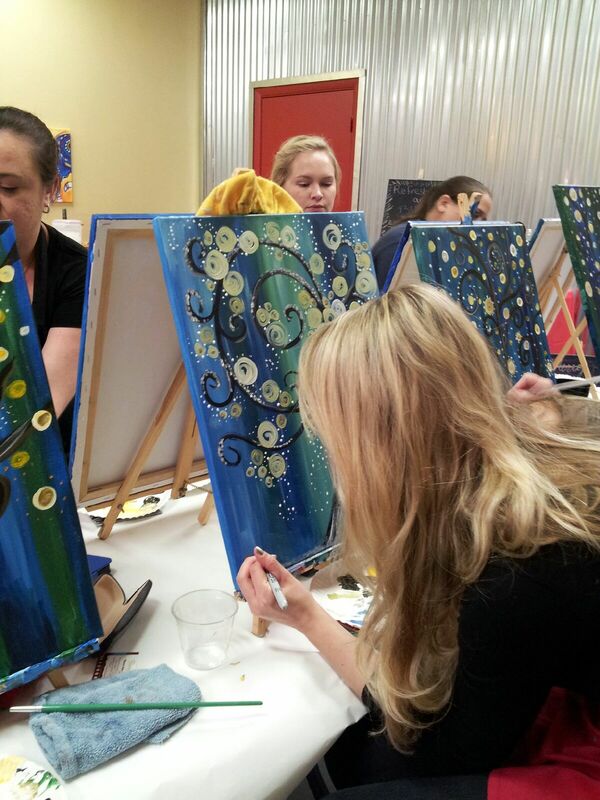 At which point, I was completely consumed in my painting and glazed over to the class around me. The next thing I knew, the teacher was behind me asking if she could hold up my painting for the class. “How original and whimsical” she exclaimed. At the end I had people come up to me telling me that my painting was the best in the class, and a few even asked if they could take a photo of it. This experience rekindled many things for me. Maybe the pressure of using my creativity for a career is too much, BUT I should be using it for enjoyment, stress relief and fun. After this class I vowed to keep finding ways to be creative, just because it isn’t my career, doesn’t mean I shouldn’t be exploring it. Best of all, I was able to bring home something I was proud of to my Grandparents. If you haven’t tried Painting with a Twist, or one of the many similar classes, I highly suggest it.